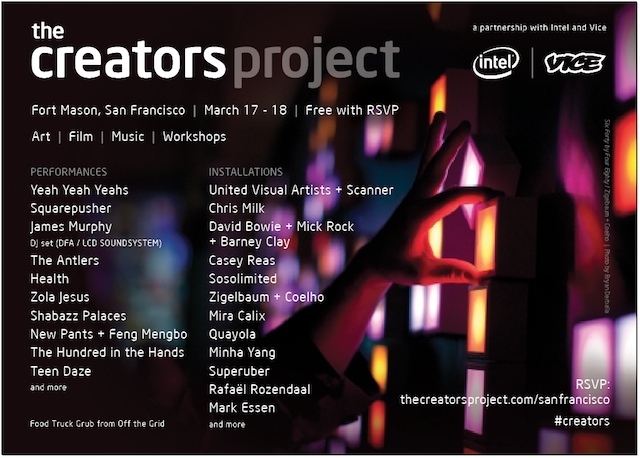 The Creators Project has announced a lineup for their 2012 event, to take place in San Francisco’s Fort Mason venue on March 17 and 18. The list includes acts the likes of New York City indie rockers the Yeah Yeah Yeahs, electro-DJ James Murphy and English electro artist Squarepusher. Check out a full lineup after the jump. The Creators Project launched in 2010 to “empower emerging and leading artists who are pushing the boundaries of creative expression through technology.” After hosting cultural festivals in places like Beijing, Sao Paulo, New York, Paris and Seoul in 2010 and 2011, the event has chosen San Francisco for its third year of festivities. The initiative will transform the historic Fort Mason site into an interactive and visual two-day event that will showcase a creative intersection between art and technology. Iinstallations from David Bowie + Mick Rock + Barney Clay, United Visual Artists + Scanner and many other innovative sets will also comprise the lineup of main events. Performances will include a headlining set by the Yeah Yeah Yeahs, Squarepusher’s first live U.S. appearance in 7 years, and sets from The Antlers, Health, Zola Jesus, and others. Check out the festival’s official site for more information on ticketing and RSVP details.